Earlier this summer, I read Hugh Howey's Wool. If you have not read my post about that book, I strongly encourage you to go back and do so. Look, I'll even give you the link again to make it easy for you - click here to read it. Are you done? Did you read it? Good. That post encapsulates much of my feelings on Hugh Howey as an author. 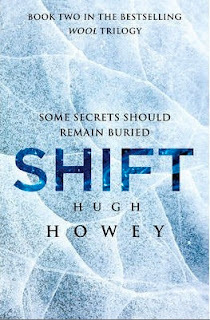 Ever since I put Wool down, I have been dying to get my hands on Shift, the prequel and second book in the Silo series. When I finally found a copy a few weeks ago, I blazed through it just as quickly as I did its predecessor. I felt a little badly since I am currently reading a half dozen books and I completely disregarded all others until I finished Shift. No regrets, though; it was totally worth it. The first shift finds Donald at the start of his first term in Washington. His relationship with older, well-respected Senator Thurman opens the door to join a top-secret project. Donald, whose education was in architecture, is asked to design an underground silo for the workers of a new facility meant to house used nuclear cores. He is kept highly isolated from anyone else working on the project under the premise of confidentiality. The only people he speaks to about his work are his best friend and the Senator's daughter, Anna, who also happens to be Donald's ex-girlfriend. The years go by; the facility is built without Donald every realizing its true purpose or replication fifty times over at the same large site outside of Atlanta. This timeline ends as the National Convention takes place at the new facility - a different state is camped out over each silo. As a young girl sings the National Anthem, the bombs fall and people are ushered into the silos. Donald and his wife Helen end up in separate silos, right next to each other. Meanwhile, in between chapters about the young congressman, a man name Troy is woken from cryonic sleep and set to work in Silo 1. Here, unlike in the other silos, men work six month shifts and then are put back to sleep for decades until their next shift. Troy finds himself in a high-up position, responsible for monitoring the other 49 silos and ensuring their health. During this, his first shift, he is forced to order the collapse of Silo 12, killing every one inside. As his shift wears on, he begins avoiding the drugs the workers are given regularly and starts to remember his past. As he does, we realize that Troy is, in fact, Donald. The second shift finds Donald woken by Thurman and Anna. There are problems among the silos they believe only he can solve. He and Anna work together in isolation, hidden from the rest of Silo 1's workers. During this shift, Donald comes to realize that Anna orchestrated his separation from Helen in an attempt to be with him. Helen, as it turns out, died many decades ago, having been a wife to Donald's best friend and mother to his children. This revelation only serves to anger Donald and further his resentment toward Thurman and the other orchestrators of the project. Simultaneously, over in Silo 18, an uprising peaks in a bloody battle and ends in a return to some sort of drug induced normalcy for the residents. Upon being awoken for a third time, now centuries from the original timeline, Donald finds that the workers believe him to be Thurman. Someone has switched their identification. As he runs Silo 1 and makes heady, morally questionable choices, Donald works through another crisis in Silo 18 involving - you guessed it - Juliette. In flashbacks, we learn the story of Jimmy/Solo in Silo 17. Throughout this final shift, Donald clearly has come into his own. He burns with anger and revenge for his personal losses and those of the world. The book ends at the same future point Wool does. This sets up the third and final book, Dust, to join the two stories of Wool and Shift for a simultaneous exploration of what exactly is happening above the surface of the silos. It was fascinating to learn the "other side" of the story after reading Wool. I definitely missed Juliette, who was my favorite character in Wool. I understood, though, why the back story was so necessary. I cannot wait to read Dust. Thankfully, I won't have long to wait. In a happy coincidence, the book is being released on August 17, which also happens to be my birthday! I have pre-ordered it from Amazon. Kevin has to work that morning, so I plan on diving into Hugh Howey's imagination for the first part of the big day. Perfect birthday present to myself. If you have not yet read this series, I urge you to pick it up at your earliest convenience. Actually, forget convenience. Go download it right now. Amazon has each of the books (Wool, Shift, and Dust pre-order) available for $5.99 each. While $18 may seem like a lot, it is about the price of any other book in a bookstore. This way, however, you are getting three for the price of one. If you really can't bring yourself to pay for them straight away, at least download the first section of Wool for free and see what you think. I doubt you'll be able to resist continuing. There is something so magically about a book you literally cannot put down. I found myself reading Howey's work in all sorts of inappropriate social situations. The urge to read one more page simply overcame any other focus. Thankfully, I read most of it over a weekend and I did not have to face the battle during the work day. That would have been too tempting to resist. Instead, I just got an abhorrent lack of sleep for a few days. Again, totally worth it. What book releases are you anticipating? What have you read that you simply cannot put down?